One of the most frustrating things about Parkinson’s Disease is finding yourself unable to do things that you used to enjoy doing. I suppose this applies to aging in general, but with PD, it is premature aging. I was never a great skier, but it was something I enjoyed. I didn’t grow up skiing. As a kid, I only skied a few times…day trips with a church youth group to a small ski slope in south central Pennsylvania, where the numerous ice patches made skiing more of a contact sport than it was ever intended to be. My wife had a similar limited exposure to skiing in her youth. But one year we decided to try skiing out west. This evolved into an annual family ski trip. In the early years, I looked forward to my kids getting a little older, so that we could ski together. That was short lived. Have you heard the three scariest words that you will ever hear on the ski slope? I’ll clue you in. If you ever hear “Follow me Dad”, think twice. As a skier, I peaked in my early 40s…and gradually accepted the limitations of getting older. There would be no more trying my luck on the black runs, the blue and green runs were enough. The year before my PD diagnosis, we skipped the ski trip in favor of a big Hawaii trip. 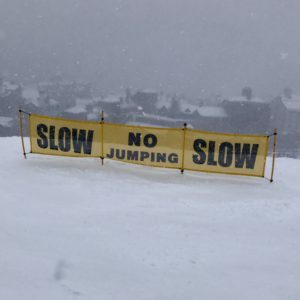 The following year, when we returned to Colorado, I wondered how PD would effect me on the slopes. The answer was “quite significantly”. I went out to the slopes as if nothing had changed, but it quickly became evident that something was different. I could not turn to the right. I was near the top of the mountain and had chosen a run that had a sharp bend to the right. To make a long story short, I ended up walking down that mountain carrying my skis. I wasn’t ready to give up. The next few days, I went back to the kiddie (beginner) hill and practiced. My right foot has a tendency to drag when walking, and when I analyzed my turns, I eventually noticed a similar drag when turning to the right. If I made a more gradual turn, I was able to turn to the right. 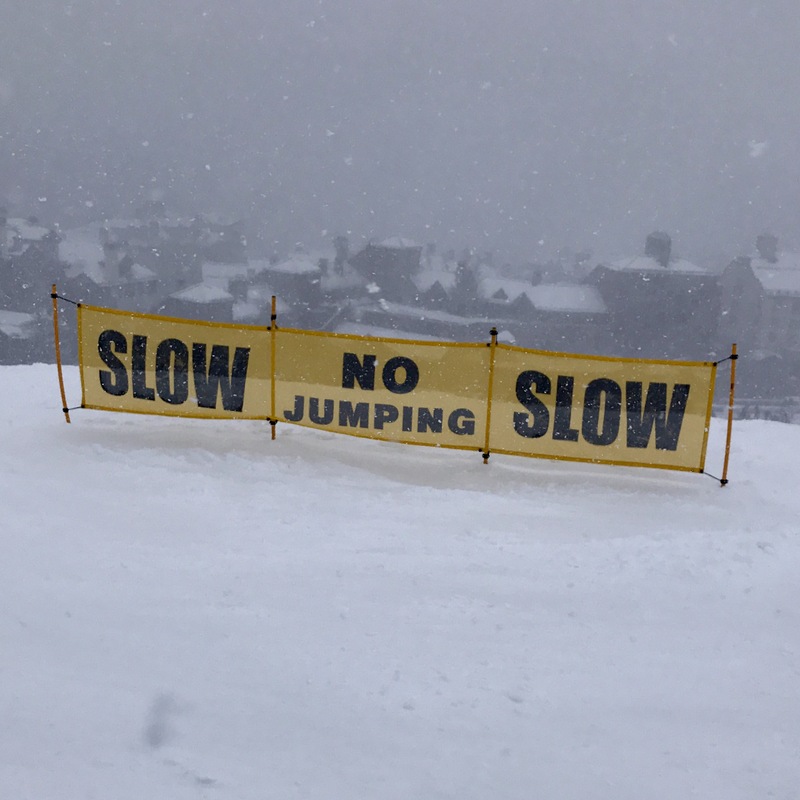 On the last day of our trip, I managed to ski down a green run, and considered it a small victory. During the year that followed, I stepped up my exercise program. My wife and I also did some research on skiing with Parkinson’s. I was inspired by Dr. David H. Blatt’s videos, where with intense exercise, he was able to continue to ski, and even slalom race. My wife found that most major ski resorts have Adaptive Skiing programs, designed to help people continue to ski after a physical disability. Speaking with them about my condition, they also recommended that I purchase Apex MC-2 boots. By the next year, I was in better shape, and signed up for a 3 day adaptive skiing lesson at Beaver Creek, Colorado. The first day went pretty well, and the instructor helped me work on my turns. We moved from greens to easier blue runs. After lunch, my legs were tired, and after a few falls, we called it a day, so that I could rest. Day 2 was a disaster. From the start, my balance was off, and my right turns were almost nonexistent. The instructor eventually had to tie guide ropes to my skis and lead me down the mountain. Dejected, day 3, it was back to the kiddie hill. Considering that I had a great first day, I can only figure that PD makes my legs tire more quickly. In the year since my last skiing trip, I stepped up my exercise intensity considerably.The week before this year’s trip, I ran 13 miles in a half marathon. And I had completed nearly a year of Rock Steady Boxing, which included challenges like the recent day where we did 200 push-ups, 200 sit-ups and 200 squats. This year’s trip was both encouraging and discouraging. Day 1 showed continued improvement over recent years. Right turns were not a challenge. I could easily pivot back and forth without overthinking the movements. I felt close to my old self. Late in the day, I felt my muscles challenging my movements a little bit, so I called it a day. But overall, I was ecstatic and ready to claim victory over PD when it came to skiing. Day 2 was more challenging. I had to think through more of the movements that were natural the day before. After a couple hours, right turns, in particular, became more challenging. Day 3 was downright discouraging. Where PD seems to effect me most, and drive me crazy, is in the things that should be easy, like putting on and taking off ski boots, or worst of all, putting skis back on after a fall. The frustration of putting my skis on after a fall is enough to drive me mad…why is it so difficult to line up my boot to the ski and press down? Twice it took me 15-20 minutes to get my skis back on. This experience left me so weary of falling, that I was done. Some days Parkinson’s wins a decisive victory against you. Needless to say, a day off the slopes was in order…before a final day of skiing this trip. This last day didn’t start off too well. I could not get my boots to click into my skis. After having my wife and son each spend 5-10 minutes trying to help me, I sent them on, telling them I’d catch up to them if I could. None of us spoke what we were all thinking…I was done skiing. The ski that was challenging me, as usual, was on my PD affected right side. I had no problem on the left side, where I could easily put either ski on and take it off. Finally, I decided to sit down and scrape the snow from my boots. When I looked at the bottom of the right boot, the problem was obvious…a big chunk of ice running down nearly the length of the boot. I chipped at it, and scraped it. And surprisingly, I now had no problem putting on the ski. PD was not to blame this time. I caught up with my family just long enough to complete one run before my kids went off for more adventurous territory. It wasn’t quite like old times, but I did end the day cautiously taking a blue run down the mountain. A narrow victory, but I’ll take it. Don’t hesitate to limit your time on the slopes to a half day at a time, and plan rest days. Exercise. Squats, running and lunges are great for getting you ready. Balance exercises are also good…I’m sure BOSU exercises have been helpful for me. Consider buying your own ski boots instead of using rentals. The Apex MC-2, which lace up like snowboard boots seem to work well for me, aside from the ice buildup which is probably not unique to these boots. 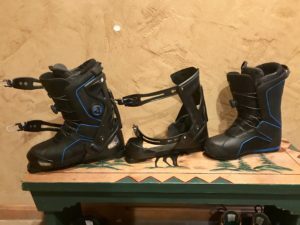 A big benefit is the detachable ski boot connector, which makes them easier to walk in before or after skiing. Take it slow…and celebrate any small progress. Your comments are right on the Mark. I can relate to your experience with skiing with PD. Only difference is that I spent 40years skiing as a Ski Patroler before retiring to a recreational skier. Big difference. I still have the passion for skiing,but PD reduced my skill level and stamina. I too have the Apex boots. Best boot in 40 yrs of patrol experience. My wife of 40 yrs married into the patrol. My 2 daughters were born into the patrol.One also is a Patroler (21yrs) the other is an adaptive Ski Instructor.. We are a skiing family, I’ve had to adapt my way of skiing. Being an S & T Examiner/Trainer for 19yrs, I think I know how to ski. Not anymore. Helpful hints. Follow some one. Let them pick the best route and turns. Now you can focus on starting and finishing one turn at a time, not looking 10 turns ahead. Better concentration = Better turn. Limit 2 hours. Know when to quit for the day. Ski tomorrow. Thanks for sharing. I’m relatively new to PD (getting close to 3 years now), but I think it is important to try to stay connected to the things you enjoy in life…and stay active…even if it is frustrating at times. Your tip about following someone is a very good thought. As long as that someone is not my teenage son! One turn at a time is a great way to look at it…and probably a pretty good philosophy off the slope as well. I have been skiing most of my life. It became the main winter activity for my family as I raised my children skiing weekly at the local slopes in Michigan taking a spring break ski trip to the mountains. I recently have been diagnosed with PD and am anxious about skiing for the first season since the diagnosis. I am happy to hear that others are still able to continue to ski, and appreciate the information written here. I will use these tips as I clip into the boards for the first time this season at my local ski area and when I go to Snowbasin Utah resort to ski with my son who is an excellent skier. Hi, I’m 2y diagnosed with PD and decided to retire (I’m 54) because I want to do as much sailing and skiing as I can. I’m spending the season this winter in Chamonix, so far been here for 2w. I particularly want to do off piste and ski touring. My problem is freezing up when the going get tough, particularly after lunch. I’m ok on hard pack and on chopped up snow, but struggle in the deep stuff. For the first time now I’m noticing that my skiing gets a real sinemet boost, particularly 1-3pm (I take my second dose at noon) if I’ve been skiing all morning. It’s not just better coordination, it’s also a sense of confidence and enthusiasm that really helps. Sometimes I’m skiing just as well as ever. But not everyday. It seems to make sense to make the most of the 1pm-3pm window, so I delay lunch till 3. As regards the quality of skiing down afterwards, the less said, the better! Have you talked to your doctor about trying higher doses of carbidopa levodopa (sinemet)? I spent 3 years using a dopamine agonist before realizing that it wasn’t right for me, and I’ve been on C/L for less than a year, so I am no expert. I workout in the mornings, and noticed that doubling up on my C/L for the morning dose gave me stronger workout…specifically better ability to perform more complex exercises. My neurologist agreed and updated my prescription. An unrelated medical issue led me to a different major medical institution, and I was encouraged to consult a well respected neurologist there. After a lengthy discussion and assessment, he gave me parameters for trying different doses and learning how my body reacts. End result is that my regular dose was upped, but if I’m going to be doing something physically demanding, I take a higher dose. Your comments make me smile…I hope you’ve saved enough to keep up an active retirement for many years to come. hi all. diagnosed with p.d. 10 years ago. i’m turning 65 this month I’ve been skiing since I was a child. i had back surgery last winter and could not ski and when I tried to ski this year I found my balance or lack thereof was a problem. I am going to meet with the adaptive program people and decide if outriggers (little skis on your ski poles) will give me that extra support for balance. I have sought out adaptive ski lessons twice. the first time it was for my right foot not responding to turns as you wrote about. my instructor helped me to make my right and left turns with just my left foot and let my right foot go along for the ride. this works somewhat when I plan to ski that way but when I try to ski as I used to it just doesn’t come naturally. My second adaptive lesson my instructor left me with these words “this is your new norm, accept it”. At times I can use this as my mantra while other times I feel short-changed. regarding equipment i use racing pole straps where the strap is actually on my ski glove which i click in to the pole. This clicking in is easier than trying to get my hand to cooperate and put it into a traditional strap. i think my skiing may be done however and I am morning the loss of a sport I have loved and excelled at all my life. it makes me sad. susan m.
I think that Parkinson’s makes it harder to fully recover from surgeries and injuries. I had brain surgery last fall (meningioma removal unrelated to PD, but discovered because of PD), and although I should be happy that surgery was successful, my fitness level is not back to where it was. My “come back” has been hampered by a multi-week battle with kidney stones, then a sprained ankle, followed by reoccurrence of an old foot injury. I may end up sitting out this season, but because of my foot and ankle issues, I’ve been spending more time on low impact exercises, and I can’t help but think that balance board exercises I’m doing now is what I should have been doing to prepare in years past. I have skied all my life andI have had PD for thirteen years . My biggest problem is getting back up when I fall. I work out every day and have been focusing on my core. The only way I can get back up is to take boots off , hard to do not the steep , any suggestions folks? I assume you’ve tried different ski boots? I’ve been happy with the Apex MC-2, but you may want to talk to people at a ski shop…also give a call to an adaptive ski program to discuss the issue with them. There may be boots that work better for you. Balance board exercises might also help? Squats and curls on a BOSU? Stationary backward lunges? Unfortunately, ski boots can be so tight and restrictive, not to mention awkward…that they add a layer of complexity. I was frustrated and unnerved I had just lost swimming. In the pool, my right side would become unresponsive as it fatigued. I can feel the changes in my body and mental capacity. Then I googled Skiing with Parkinson’s where I found your story. I was completely overwhelmed. I knew the site of a 63 year old crying would not be pretty and I headed for a private place. I’m not giving up, but I am trying to learn what I can still do. I want back in the pool and on the slopes. . Not sure what it will take but the desire is still there. I think I will still sign up for the Spud Man triathlon. It gives me something to work towards. I think having something to work towards is important, especially when it is exercise/activity related. Keep in mind that with PD, we are struggling with low dopamine levels. Psychologically, dopamine production is associated with our rewards pathway. Goal directed behavior and specifically delayed gratification associated with making progress toward a longer term goal, causes the body to produce dopamine…not enough to overcome PD, but I do believe it is not insignificant. Your specific struggles make me wonder if you might need a higher dose of carbidopa/levodopa (sinemet) when you are more physically active. See my comment to Josh a few messages up…it might be something to talk to your neurologist about. You may be frustrated, but it sounds to me like you’ve got the right attitude. Good luck! Brett (and everyone above): Thank you for sharing you’re skiing experiences with PD. I’m 58 and was diagnosed last January. I’ve been a recreational skiier since my teens however usually now only ski once a year on a family ski trip. I’m currently on our family ski trip in BC. I had a good 1st day yesterday. Legs were tired when finished but I then went for a 25 min. walk with my daughter-in-law. Not a good idea. I could tell while I was walking that I had overdone it but I carried on. Today is day 2. Lots of fresh snow arrived overnight which everyone was excited about. On my first run, fell and I could not get back up again. Needed help. Tried some more but I knew by the end of the 2nd run that I could not go anymore. Headed back to the chalet upset and very discouraged. I’m a Personal Trainer so I work out regularly and I’m in very good shape. I could not believe that my body was not ready to ski today. Reading everyone’s comments have been so helpful and encouraging. I could not figure out why my ski boots were so hard to get off and on…now I know why. I’m going to look into the boots that have been mentioned. I now know that I have to take more breaks and rest days (today is now one) and I’m going to look into adaptive programs. I don’t want to give up skiing as its something I love to do and brings our family together for. Reading everyone’s story has helped me know that I’m not alone and other Parkies are skiing too (just in individual ways that work for them).